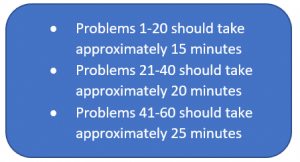 ACT Math Strategy — Know Your Pace! Like everything in life…timing is crucial. These words ring incredibly true on standardized tests. Below, I will share some quick thoughts and suggestions on the importance of knowing your pace while taking the Math section of the ACT. 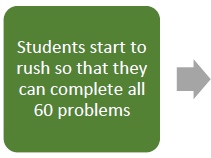 The Math section of the ACT is 60 minutes to complete 60 questions – on average, 1 question per minute, with the easier problems being near the front of the test and the more difficult problems later in the test. 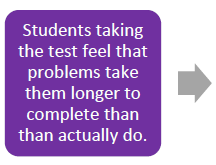 Because of the way that the test is set up, it is important that students are working at a quicker pace near the beginning, to allow for more time for the more diffcult problems. 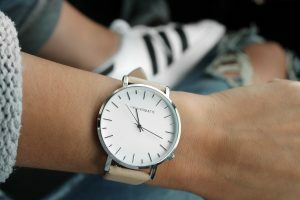 Keeping track of your time is one of the easiest and most effective ways to raise your score. Additionally, this tip is one of the most important ways to help combat text anxiety for students who deal with it during standardized testing. Here are the benchmarks that I suggest to students on the Math section of the ACT to help provide direction on timing. 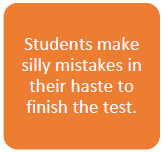 Taking practice tests while timing yourself helps to create the muscle memory that students need. It helps to drive up confidence and helps reduce test anxiety at the same time. TIP: Be sure to time yourself on all sections of the ACT and practice taking tests with a timer. 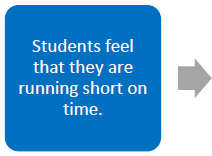 Knowing your time throughout the test will help understand your pace and can help to reduce test anxiety by understanding and managing your time constraints.